Due to the continuation of the severe cold weather, the Cuyahoga County Probate Court will be operating at a reduced staff on Thursday January 31, 2019. All hearings have been cancelled in order to protect the public from the severe cold. Should the County Executive close the Old Courthouse building, the Court would be required to close as well. Further updates will be provided. The Cuyahoga County Probate Court will be operating at a reduced staff on Wednesday January 30, 2019. All hearings have been cancelled in order to protect the public from the severe cold. Should the County Executive close the Old Courthouse building, the Court would be required to close as well. Further updates will be provided. The Cuyahoga County Probate Court is pleased to announce the opening of its Recource Center for self-represented parties. The purpose of this service is not to offer legal advice. The Resource Center is available to assist you with questions about a simple estate, guardianship or name change. This includes the general review of all probate forms and procedures. Complicated estates or guardianships, drafting a will, trusts, adoption proceedings or any contested matter cannot be handled by the Recource Center; a referral would be made to the Cleveland Metroplitan Bar Association to obtain the name of a probate attorney. Commencing February 12, 2019, the Resource Center will be staffed by a licensed attorney and open every Tuesday, Wednesday and Thursday from 10 a.m. to 3 p.m. A one-half hour appointment may be scheduled by calling (216) 443-8769; the last appointment is scheduled at 2:30 p.m. You may also walk-in during designated office hours. All parties are limited to ONE VISIT per case. Please see the link 2017 Unclaimed Funds List for a complete list of the unclaimed funds from 2017. This list will be available until January 31, 2019. The Cuyahoga County Probate Court is pleased to announce that the next filing available for E-Filing is the “Report of Distribution of Wrongful Death and Survival Claims”. Submit all receipts and disbursements, including any documents requested at your hearing by the magistrate, as ONE FILE (.pdf format). Include your signed Report as the first page. To read more about the Probate Court’s E-File Gateway System, please see the Electronic Filing page. Please note the updated approval schedule for Accounts filed from December 4, 2018 through December 17, 2018. The new approval date is January 22, 2019 and NOT January 21, 2019. Please see the attached flyer with information about a Probate Estate Advice Clinic for the public. Probate Court is pleased to announce the formation of a Resource Center coming in 2019. Please see the information sheet. Please see the attached flyer with information about a Probate Advice Clinic for the public and attorneys(CLE credit). Please see the attached flyer with information about a Guardianship Clinic for the public and attorneys(CLE credit). Marriage Satellite Office hours at Garfield Heights Municipal Court for Friday, February 9, 2018, have been canceled. Pre-registrations online and applications at the Probate Courthouse will be available as usual during regular business hours. Marriage Satellite Office hours will resume as scheduled on Friday, February 16, 2018 at Rocky River Clerk of Court. Marriage Satellite Office hours at Shaker Heights Municipal Court for Friday, February 2, 2018, have been canceled. Marriage Satellite Office hours will resume as scheduled on Friday, February 9, 2018 at Garfield Heights Municipal Court. Please see the link 2016 Unclaimed Funds List for a complete list of the unclaimed funds from 2016. This list will be available until January 31, 2018. A birth certificate is now required for all adult and minor name changes at the time of filing. If the applicant or minor was born outside of the state of Ohio, the birth certificate will be required at the time of the hearing. Probate Court form packet Report of Newly Discovered Assets is available on the Court Website located in the COURT FORMS tab under the "Miscellaneous" topic. The Cuyahoga County Probate Court is pleased to announce that the next case types available for E-Filing are Concealment of Assets, Petition for Declaratory Judgment and Petition for Determination of Heirs. 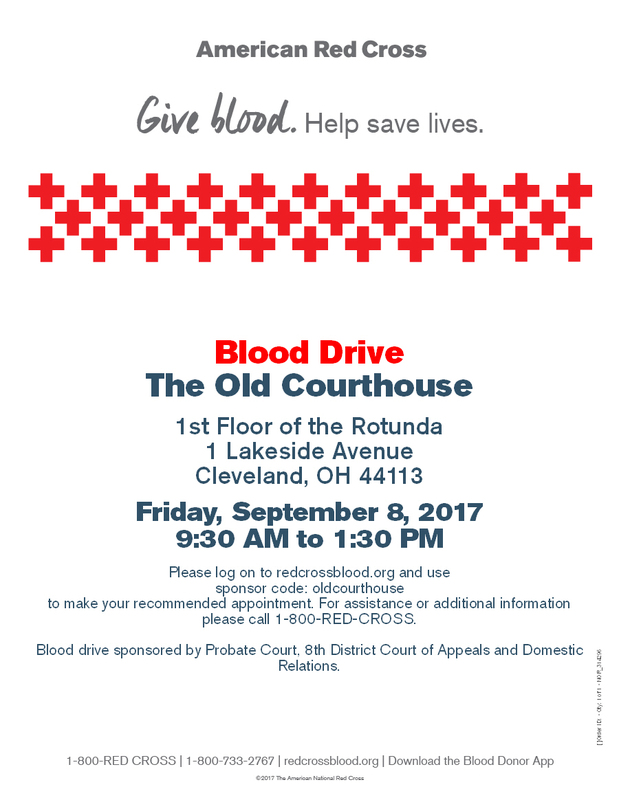 There will be a Red Cross blood drive at the Old Courthouse on September 9, 2017. Please see the flyer for details. To schedule an appointment, please see the Red Cross website. Some Probate Court Room numbers have changed. Please see the Old Courthouse Room Numbering page for more information. Effective April 6, 2017, Local Rule 58.1 Court Costs has been updated. Please see the Local Rules for more information. The Cuyahoga County Probate Court is pleased to announce that the next filing available for E-Filing is the “Commissioner's Report”. Commissioner’s Report – Submit all receipts and disbursements, including any documents requested at your hearing by the magistrate, as ONE FILE (.pdf format). Include your signed Report as the first page. The Cuyahoga County Probate Court is pleased to announce that the next case type available for E-Filing is the “Application for Appropriations”. Marriage Satellite Office hours at Shaker Heights Municipal Court for Friday, January 6, 2017, have been canceled. Marriage Satellite Office hours will resume as scheduled on Friday, January 13, 2017 at Garfield Heights Municipal Court. Please see the link 2015 Unclaimed Funds List for a complete list of the unclaimed funds from 2015. This list will be available until January 31, 2017. The Cuyahoga County Probate Court is pleased to announce that the next case type available for E-Filing is the “Application for Delayed Registration of Birth”. The Cuyahoga County Probate Court is pleased to announce that the next case type available for E-Filing is the “Application for Successor Custodian”. Probate Court form Application to Approve Qualified Income Trust (Miller Trust) (75.0) is available on the Court Website located in the COURT FORMS tab under the "Guardianship" topic. The Cuyahoga County Probate Court is pleased to announce that the next case type available for E-Filing is the “Application for Change of Name of Minor (R.C. 2717.01)”. ALL APPLICATIONS TO APPROVE SETTLEMENT OF WRONGFUL DEATH AND SURVIVAL CLAIMS OVER $100,000.00 WILL BE SCHEDULED FOR HEARING. PLEASE BE ADVISED that Applications to Approve Settlement over $100,000.00 will NOT be heard on a "Walk-In" basis, even if the fiduciary is present. Probate Court Subpoena Forms are available on the Court Website located in the COURT FORMS tab under the "Miscellaneous" topic. The Court has waived the requirement of the Clerks issuing the subpoenas prior to service; you may complete the forms online and file the forms with the Probate Clerk after service of the subpoena. Also be advised that the Probate Court Clerk's Office will no longer accept the Cuyahoga County Common Pleas General Division subpoena forms. PLEASE BE ADVISED that all attorneys are required to file a separate NOTICE OF APPEARANCE when representing a party in a Probate Court proceeding. NOTICE OF APPEARANCE forms are available on the Court Website in the COURT FORMS tab under the "Miscellaneous" topic. Please see the link 2014 Unclaimed Funds List for a complete list of the unclaimed funds from 2014. This list will be available until January 31, 2016. Please be advised that the Fundamentals of Adult Guardianship broadcast course in Cuyahoga County on March 3 has reached capacity and any new registrations will no longer be accepted. On Thursday January 21, 2016 and Thursday March 3, 2016 the Supreme Court of Ohio Judicial College is offering a six-hour training for professional guardians (attorneys, social workers). Cuyahoga County Probate Court will host the remote broadcast at the Education Center at Cuyahoga County Common Pleas Court, General Division, 1200 Ontario Street, 12th Floor, Cleveland, OH 44114. All professional guardians of adults, unless otherwise exempted, are required to participate in this education before June 1, 2016, pursuant to the Rules of Superintendence for the Courts of Ohio 66.06 and 66.07. The Ohio Supreme Court also offers an online training broadcast, for which CLE is not offered. These courses are tuition free. There are also broadcast sites available in other northeast Ohio locations on February 19, April 12, May 20 and June 8. Please visit the Supreme Court of Ohio Judicial College Academy to preregister for any of these trainings. On Friday December 18, 2015, the Supreme Court of Ohio Judicial College is offering a six-hour training for professional guardians (attorneys, social workers). It will be broadcast remotely to the offices at Cleveland Metropolitan Bar Association, 1375 East 9th Street, Floor 2, Cleveland, OH 44114. All professional guardians of adults, unless otherwise exempted, are required to participate in this education over the next six months, pursuant to the Rules of Superintendence for the Courts of Ohio 66.06 and 66.07. This course is tuition free. Please visit www.judicialecademy.ohio.gov to preregister for this training. The Cuyahoga County Probate Court is pleased to announce the launch of our E-File System. The Court is launching its E-File System by CASE TYPE. The initial case type available for E-Filing is the “Application for Change of Name of Adult (R.C. 2717.01)”. The Court is anticipating that several additional case types will be made available for E-Filing in 2016. You will be notified accordingly. To read more about the Probate Court’s E-File Gateway System, please see the Electronic Filing page located. Please see the Local Rules page for updated information on Local Rule 34.1 and Local Rule 58.1. Please be advised that Commissioner's Reports require supporting documentation including, but not limited to, signed acknowledgment of receipt of funds from beneficiaries and/or copies of cashed checks. The Court will accept the Commissioner’s Report if the supporting documentation is provided with the Report. If these items are not provided, the Commissioner’s Report may be scheduled for hearing, thereby delaying the acceptance of the Commissioner’s Report until the supporting documentation is provided. Please be advised that Reports of Distribution for Trusts, Estates, Guardianships and Minor Settlements require supporting documentation. The Court will accept the Report of Distribution if the supporting documentation is submitted with the Report. If the proper documentation is not provided, the Report of Distribution may be scheduled for hearing, thereby delaying the acceptance of the Report until the required supporting documentation is provided. A new Probate Court Guardianship Complaint form is now available under the Court Forms. There are two new local rules concerning Guardianships. Please see the Local Rules page for more information on Local Rule 66.4 and Local Rule 66.03. Due to dangerously cold conditions, the Cuyahoga County Probate Court will be closed on Friday, February 20, 2015. Probate Form 14.0 has been updated by the Supreme Court of Ohio and is now available on the web. Probate Forms 22.5, 22.6 and 22.7 have been created by the Supreme Court of Ohio and are now available on the web. All forms are effective January 1, 2015. See more detailed information at Court News Ohio. Please see the link 2013 Unclaimed Funds List for a complete list of the unclaimed funds from 2013. This list will be available until January 30, 2015. Please note the new link under the Home Menu which takes you to the Cuyahoga County Employment page. Probate Court, as well as other County job postings will be posted there. Effective April 21, 2014, Local Rule 58.1 Court Costs has been updated and Rule 78.4 Durable Power of Attorney for Health Care has been added. Please see the Local Rules for more information. Probate Forms 12.0 packet (Forms 12.0 and 12.1), 19.2, 19.3 and 25.0 packet (Forms 25.0, 25.1, 25.2, 25.3, 25.4, 25.5, and 25.6) have been updated by the Supreme Court of Ohio and are now available on the web. They are effective March 1, 2014. See more detailed information at Court News Ohio. Due to dangerously cold conditions, the Cuyahoga County Probate Court will be closed on Tuesday, January 28, 2014. Marriage satellite location hours will be from 9:00 a.m.to Noon & 1:00 p.m. to 3:00 p.m. for the Berea location on January 24, 2014 due to the scheduled Court shutdown. COMMENCING JANUARY 27, 2014 ALL INVENTORIES AND ACCOUNTS WILL BE PAID FOR AND FILED IN ROOM 121 PRIOR TO REVIEW BY THE ACCOUNTS DEPARTMENT IN ROOM 113. On Friday January 24, 2014 the Probate Court and the Clerk's Office will be unable to accept any filing or payment after 3:15 p.m. in order to complete a data backup of its case management system. This is being done in conjunction with the county's power shutdown on January 26 during the demolition of the former County Administration Building. The Probate Court and Clerk's office will resume normal operations on Monday January 27, 2014 at 8:30 a.m. Thank you for your anticipated cooperation and understanding. Please see the link 2012 Unclaimed Funds List for a complete list of the unclaimed funds from 2012. This list will be available until February 7, 2014. Due to dangerously cold conditions, the Cuyahoga County Probate Court will be closed on Tuesday, January 7, 2014. Effective Monday December 9, 2013 Cuyahoga County Probate Court implemented Local Rule 8.2 Special Process Server. For more information please see our Local Rules and search by Local Rule Number "8.2" or by Local Rule Topic "Special Process Server". Effective Tuesday October 15, 2013 Cuyahoga County Probate Court will require death certificates on the initial filing of all estate cases. You can now search our online docket to find out if you or one of your relatives are a party to a probate case that closed with unclaimed funds -- something that happens when an executor or trustee can't track down at least one beneficiary, or if a guardianship closed without locating the ward. The person owed money will appear with the party role "entitled beneficiary" on the case, and the online docket will list the approximate amount owed. Unclaimed inheritances can be collected by filing a Motion to Release Funds in Room 121 of the Probate Court. You will need to bring proof of identification, proof of your relationship with the deceased (for example, a birth certificate) and the case number. The filing fee is $20, cash or credit card. Once the motion is approved, you take the court order to the prosecutor's office, which is on the 9th floor of the Justice Center, 1200 Ontario St. After approval by the prosecutor's office, you will go to the county fiscal office for the funds to be issued. In accordance with R.C. 149.45, any person who is a peace office, parole officer, probation officer, bailiff, prosecuting attorney, assistant prosecuting attorney, correctional employee, youth services employee, firefighter, EMT, or investigator of the bureau of criminal identification and investigation residential and familial information may request to have their personal address and phone number redacted from the internet. If you believe you fall under one of these categories, please see the Court Guidelines for filing a request. As of July 3, 2013, the Court's case documents will be available on our online web docket in a redacted format. If you are looking for a document or even a regular copy, please check the Court's public docket. If certified copies are required, those copies still must be requested from the Court. It is especially important to note that you cannot print your own Letters of Authority from the web docket; the only approved letters are the ones certified by the Court. The documents will be available for dockets dated December 19, 2011 and beyond. There is also a new ten (10) day delay for all documents for redaction purposes. Please allow ten (10) days to pass and on the following day the item will be available for viewing. Thank you.